Your dog might not be able to join a gym or participate in the latest diet craze, but he can lose weight with your help. 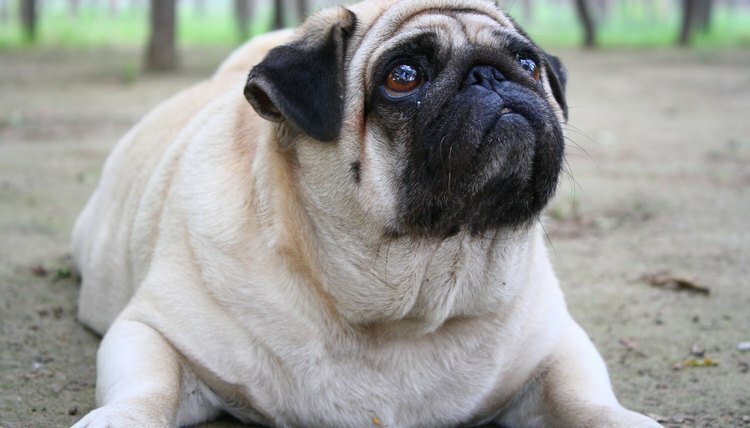 Overweight dogs experience many of the same problems that people do, including high blood pressure, diabetes, arthritis, joint damage and digestive disorders. A sensible weight loss program that features a healthy diet and plenty of exercise can help him lose those extra pounds. Other possible causes of obesity include pancreatic cancer and Cushing’s syndrome, a condition caused by excess levels of the hormone cortisol. Your dog’s food may be to blame for his weight gain, particularly if you continue to feed your adult dog puppy food. Puppy food contains increased calories to meet the needs of growing dogs, but it isn’t recommended for older dogs. If your dog already eats adult food, ask his veterinarian for a recommendation regarding decreasing food amounts based on your dog's size and the desired weight loss. Your veterinarian also may recommend that your dog try a prescription weight loss food. High protein, low-fat prescription dog foods provide all the nutrients he needs without the extra calories. Make sure you read the package instructions before feeding your dog, and only feed him the recommended amounts for his target weight, not his current weight. Too many dog treats can lead to extra pounds. Reduce the frequency or the amount of treats you offer your dog or look for treats that are low calorie. Feeding him table scraps can contribute to weight gain. Although it might be hard to resist those pleading eyes, don’t feed your dog leftovers from your meal. If he enjoys dog biscuits, buy low-calorie varieties and break them into small pieces before offering them to him. PetEducation.com notes that treats should never comprise more than 10 percent of a dog’s diet. Exercise helps melt away those excess pounds, whether you’re a person or a dog. Take your dog on at least one brisk walk each day, and make time to play a game of Frisbee or fetch with him on a regular basis. Start slowly. He’ll need time to develop endurance and stamina if he’s not used to exercising. Keep his age and overall condition in mind, and stop any activity if he starts panting or seems tired.